Samples and Resources for Landing (and Acing!) The Interview! You want to volunteer in a local animal shelter. Or, you want to enter a college program. Or, you want to apply for the next level in your state's child licensing program's career lattice. Or, perhaps you are looking to change jobs and apply for a preschool position at a different center. Well, each of these require an updated resume and.....EEK!... you haven't updated your preschool teacher resume for YEARS! In many areas there are 10 applicants for every job.with spelling and punctuation errors all over it and then sits around wondering why they aren’t getting any calls for interviews! While you may know the basics of writing a resume, maybe you haven’t heard of some of the small things that you can do on a resume to increase your chances of getting called. Writing effective cover letters and resumes is important. 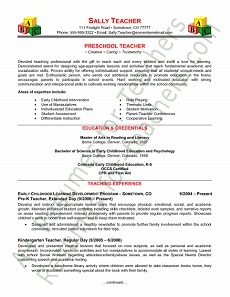 There are keywords you should have in your preschool teacher resume to help it rise to the top of the many applications each job opening receives. Sometimes it helps just to see some samples of preschool teacher resumes to get your creative juices flowing. I found a great detailed article on writing a teacher resume written by Jennie Kakkad. In her article, she gives tips on how to frame all your skills, abilities, talents, and credentials in an organized layout. You can read her article, How To Build An Impressive Teacher Resume here. I also found a website with samples and great tips! 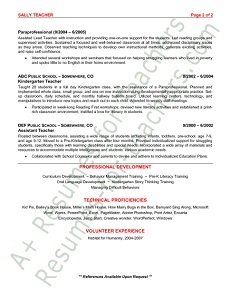 The following sample resume for a preschool teacher is from A+ Resumes for Teachers. Writing effective cover letters and resumes is important and A+ Resumes for Teachers site can help! The site is loaded with information on resumes, cover letters, interview tips and job search help for teachers, administrators, and other faculty positions. If you would like additional help with your teaching resume and/or cover letter, I highly recommend Candace Davies' (the author of the above-mentioned website) book - 101 A+ Teacher Resume and Cover Letter Writing Tips. Candace is a certified resume and cover letter writing expert and a certified career and interview coach with over 16 years in the industry. She knows what she's talking about! What do should you say at an interview? What should you NOT say at an interview? Do NOT put down or bad mouth a program you previously worked at or the program you are currently working in. What the interviewer hears is: "This person will badmouth anyone...and we could be next!". It's not professional! It's the equivalent of gossiping. It puts YOU in a bad light. DON'T DO IT! Even if your previous program was or is "all those things" (fill in the blank: never within ratio, gossipy, dirty, etc. and not willing to make changes), rather than share those (very valid) reasons for not wanting to stay, tell the interviewer, when asked why you are leaving (or have left) the other program, why you are applying with THEM. "I saw the ad for the position here and am looking to grow in the field and think I would learn and grow in the field and be a great fit for the position." or something like that. There are many resources out there to help you develop wonderful interview skills! But this one is by far my favorite! This book is written by Candace Alstad - Davies, the Founder and Owner of the site A+ Resumes for Teachers that I mentioned earlier. This book is fabulous! Candace calls this book the "crib sheet" for interviews.....and it is! What you should know about any school district before the interview. Why you should list your traits and skills and prepare for anything. What principals are really looking for in a teacher. How to create an interview winning resume. What to include in your teacher cover letter. The importance of having a teacher portfolio. How to conduct a successful job search. Why so many school districts use behavioral interviews. How to conduct a successful demo lesson plan. If you are really ready for the interview with the final interview checklist. What to wear on the interview day. A few things to do and remember as you approach the final minutes before the interview. The four stages of a job interview to give you an understanding of the process. Some important steps not to overlook at the end of the interview. What NOT to do during the interview. Helpful checklists to get you through your job search and interview. 152 teacher interview questions and potential answers; plus seven more questions that the interview panel shouldn't ask you. 18 questions you could ask the interview panel. AND Five Thank you letter MS Word templates you can modify and use. Don't Wait Until You "think" You'll Need One! As stated earlier, it's important to have a current (updated) resume. You never know when you will either look into another position or want to do something else (volunteer somewhere or other activities listed earlier) that will require one! Know the expectations of YOUR job description! Learn how to create a Staff Handbook!